Located in the core of Victoria’s downtown, across the street from the Atrium, the purpose-built mixed-use development contains ground floor retail with 209 rental apartments above. It has a very intricate exterior design and includes three levels of underground parking, a rooftop deck as well as a communal patio area on level 12 that features a custom kitchen. 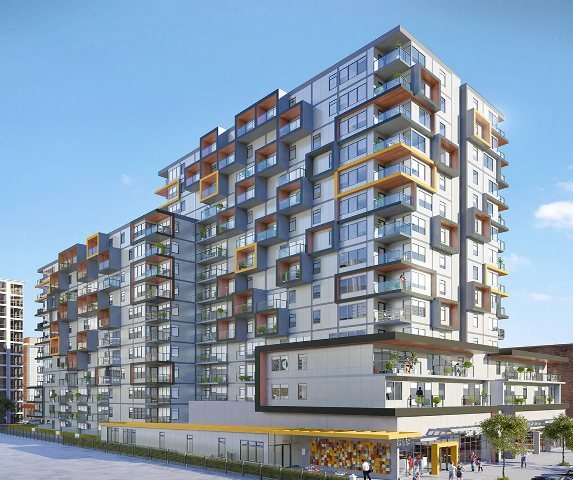 This is Chard Development’s 7th consecutive project in Victoria since 2003, and the project has been pre-sold to Realstar – a major Canadian investment group and operator who will own and manage the rental suites. There were areas of the construction that required Atlas to provide a detail that compensated for the build-up on parapet walls. CST pedestals were used in a horizontal application as a spacer to get solid bearing on the concrete and still keep the anchor flush with the finished wall material. Eliminating any damage to the wall when anchors are in use.